When one man is killed in combat, it isn’t just a man who dies. It is a son, a husband, a father, an uncle, a friend, a fellow soldier, and sometimes a leader who puts the safety and welfare of others in front of his own. Lt. Col. Mike McLaughlin was all of those people. Early in the morning on January 5, 2005, in Ramadi, Iraq, he was with a crowd of 300 Iraqis who had responded to an Iraqi police recruiting drive. He was following the first priority of a military officer: Accomplish the mission. In that, he fulfilled a leader’s second priority: Look out for the welfare of your men. Unfortunately, he wasn’t okay. He died from the wound. The responses of those who knew him reveal what was lost to the world. Tammy McLaughlin lost her husband. Their two daughters, Ericha and Erin, lost their father. Michael Marzano didn’t always want to be a Marine. “I believe he was about two years old when he decided,” said his father, Marine Sgt. Al Marzano, who served from 1969 to 1972, including a tour in Vietnam. His desire to serve grew with him as he got older. Al remembers Michael loving to dress up in his Marine uniform. In Sharon (PA) High School, Michael developed into an ideal candidate for the Marine Corps. He competed in wrestling and became a very good boxer. Unfortunately, during a wrestling match, he tore a ligament in his knee. When he tried to enlist in the Marine Corps after graduation, he was rejected. But Michael wasn’t one to give up easily. Corrective surgery on his knee and rehab straightened out that problem. He continued boxing, even flirting with the idea of turning pro. But his dream of being a Marine still dominated. When he tried to enlist again in 1969, he was accepted. After training at Paris Island, Michael was assigned to Camp Lejeune. He was deployed twice to Okinawa for mountain training. While carrying a mortar tube up a hill, he lost his footing and tumbled down. He was knocked out and suffered a back injury. Upon completing his four-year enlistment, Michael got out of the Corps and started taking college classes in in Phoenix, Arizona. But the Marine Corps was still in his blood, so he joined the a Marine reserve unit. Still, he wasn’t happy because the unit was not scheduled for deployment. On a visit back to Pennsylvania in December, 2004, he transferred to the 3rd Battalion 35th Marines in Brookpark, Ohio, which was going to Iraq. The unit arrived there in March, 2005. On April Fool’s day, he achieved a lifelong goal by being promoted to sergeant, following in the footsteps of his father. Toward the end of April, Michael’s unit was in Haditha, a small city about 150 miles from Baghdad. Insurgents had severely damaged the hospital. On May 7 they still occupied it. 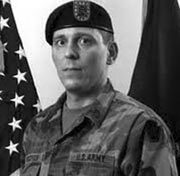 As Michael’s Mobile Assault Platoon was fighting to dislodge them, a van loaded with explosives exploded, killing Michael and three other soldiers. For his service and his sacrifice, the VA Clinic in Hermitage, PA, was named in his honor. According to his mother, Shawn Graham was probably born to be a warrior. When he was born in California where his father, Marine Sgt. 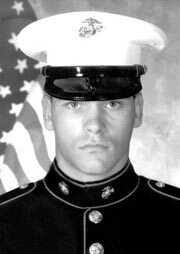 Tom Graham, was stationed, Tom’s unit made Shawn an honorary Marine. 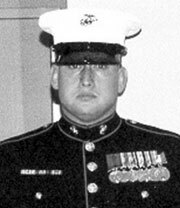 Shawn became a real Marine after graduating from Grove City High School in 1989. He could have chosen a number of career paths. He chose a warrior’s role: infantry. He served in the Marine Corps for ten years before leaving the Marine Corps to work in Texas, but the warrior in him couldn’t just quit. He joined the 124th Cavalry Regiment, 36th Infantry Division, Texas Army National Guard. Like a true warrior, he was eager to serve in the War on Terror. His father, Tom, was in Afghanistan with the Indiana National Guard, and his brother, Nicholas, was in Iraq with the Marine Corps when Shawn’s chance came to serve in Iraq with the Texas National Guard. Tom and Nicholas returned; Shawn didn’t. He was killed on September 25, 2005. Shawn’s compassion – and its source – is obvious from this: he wanted to send money to his mom so she could buy clothes at the Salvation Army and send them to him so he could give them to the Iraqi people. She told him to keep his money, and sent him boxes of stuff for him to distribute among the Iraqis. “That’s the kind of person he was,” his mom said. Obviously because that’s the kind of person she was. Few kids that age actually know what they want to be; Ross really, truly did. He grew up to be the ultimate army man whose self-sacrifice resulted in his receiving the highest honor the United States can bestow on its military heroes. Ross’s career choice never wavered. On his 17th birthday, he signed up for the Delayed Enlistment Program. During the next year, he completed the requirements to qualify for entry into the army as a PFC, rather than as a buck private. He went on duty less than a month after he graduated from Keystone High School in 2005. After training at Fort Benning, Georgia, he was assigned to the 1st Battalion, 26th Infantry Regiment, 2nd Brigade Combat Team in Schweinfurt, Germany. The unit was deployed to Kuwait, then Iraq. There the 19-year-old kid proved himself to be a man among men. During his first three months, he participated in over 200 combat missions in and around eastern Baghdad. He didn’t just participate; he excelled. 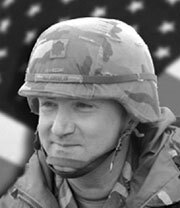 In an intense battle on November 6, 2006, he displayed such courage that his commander recommended that he be given a waiver for the time required for promotion. He performed his final act of bravery less than a month later, on December 4. Few things take more raw courage than to ride as a .50 caliber machine gunner on a Humvee maneuvering through narrow streets during urban combat. The gunner must position himself with his upper body fully exposed to hostile fire. On this day, an insurgent threw a fragmentation hand grenade onto the vehicle. PFC McGinnis tried to deflect it, but it fell through the hatch into the vehicle, which was manned by four other soldiers. PFC McGinnis could have leapt out of the Hummer to safety. Instead, he dropped down into the vehicle and pinned the grenade between his body and the radio mount. He was killed instantly when the grenade exploded, but the other four soldiers survived. Only one of them was seriously wounded. 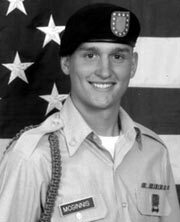 For his sacrifice, PFC Ross was awarded the Medal of Honor. Ross is the son of Romayne and Tom McGinnis. He has two sisters, Becky and Katie.